A single goal would have been enough to put us into what's still regarded as the highest quality international tournament of them all. What ended up standing between us and a place at Euro 2000 were Turkey, who the current Ireland team face on Friday and in the end a losing on the away goal rule after a 1-1 aggregate draw kept Mick McCarthy's side out of a trip to Belgium and the Netherlands. 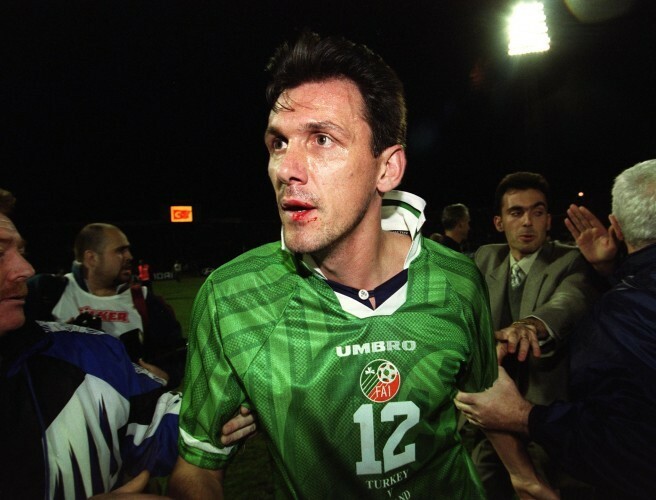 The first leg at Landsdowne Road in early winter 1999 finished 1-1 before a goalless draw in Bursa, Turkey, which ended in a brawl involving Tony Cascarino in his final match for Ireland. He joined former team-mate Kevin Kilbane and Joe to look back on that second leg and the games around it. "It was such a horrible two games," said Cascarino of the Turkey tie. "The home game and the away game. There was just nothing to choose between the two sides who we eventually get knocked out by on the away goals rule." They were also horrible games in another way as Cascarino recalled. "There was also the vile act that professional footballers hate which is the spitting. I got spat at a few times. It happened in the second leg and that's how I eventually got involved in a bit of a brawl at the end," he said. "But there were a lot of antics going on. They were fighting for everything and they came away from Dublin with a draw which they would have been delighted with." Coupled with "bad preparation" in regards to logistics, the journey to Turkey was uncomfortable too as Ireland flew into Istanbul before heading to Bursa by boat: "That was probably the worst journey out of all the games that I ever played for Ireland." And he also shared his memories of the brawl at full time. "This defender who'd spat at me, as he ran past, I just flicked his foot to trip him up. As I did it, he took a step forward and then punched me straight on the chin and within seconds it was a free-for-all!"